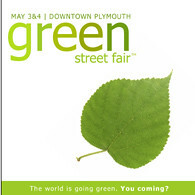 Join us for a green-minded craft fair as we celebrate the launch of the first-ever Green Street Fair in downtown Plymouth, May 3-4! Green Street Fair was founded to help educate and inform people of all ages about the benefits of green, organic, and eco-friendly products and services. To promote global interest and personal well-being, the Green Street Fair will blend companies, artisans, entertainers, and speakers together in a friendly and family-oriented outdoor environment. We believe that even the smallest steps in going green can make a world of difference. More than 100,000 people are expected to attend this new event. We’re looking for 13 vendors. Each seller will have 4 feet of space on an 8-foot table shared with another seller (space is tight, but we want to get in as many people as possible!). Each spot is for one day only, not the entire weekend. Sellers will be selected for a day depending on variety of goods represented. If you are available a specific day only during the weekend, please make sure to note that on your application. Fair FAQ coming soon, including load-in times, Plymouth information and more. Applications should be returned by e-mail to Bethany Nixon at Bethany (at) rewarevintage(dot)com no later than 5 p.m. Friday, April 4. Please copy and paste your questions and answers into an e-mail to Bethany. Vendors will be announced Monday, April 7 and payment is expected by Friday, April 16. Accepted payment methods are checks, money orders and PayPal. In addition to the questionnaire below, please provide us with three photos (or links to photos online) of the goods you plan on selling at the fair. We can’t wait for the fair, and we can’t wait to have you there! Don’t hesitate to contact us with any questions. WHICH COMPONENTS OF YOUR GOODS COME FROM RECYCLED GOODS? IF YOU’RE TRYING TO REINFORCE THE GREEN MINDSET, HOW DO YOUR PRODUCTS DO SO? Will there be a section for 501(c)3′s?